Towards the end of 1988, Greece had replaced manager Papapostoulou with Sofianidis, who had made his bow during a splendid 3-0 home friendly win against Hungary. Greece had a whole lot of winter fixtures arranged in order to prepare for their next qualification tie, which was due to be played at home to Romania on April 26. In fact, since their 3-0 defeat in Bucharest in November, they had no less than eight friendlies lined up. This was the fifth of the lot, as they had already drawn 1-1 against Albania in Tirana, their only away game among the eight, as well as lost twice 2-1 at home, against Portugal and England respectively, since the turn of the year. They would have been bent on getting it right against the plucky Norwegians, who were coming into their first fixture of the calendar year, having opened their qualification modestly, with two defeats and a somewhat encouraging 3-0 win at Cyprus. Their 1988 had ended with a 3-2 friendly defeat in Czechoslovakia, in a game where manager Ingvar Stadheim had seen a lot of promise from their new strike partnership of Sørloth and Agdestein, who had both scored a goal each. During 1988, no less than 39 players had featured in the Greek international jersey over their 12 matches. Only Olympiakos' hard man Tsaloukhidis had participated in each and every one of the 12, with 11 players appearing only once, four of these had been debutants. After their first three matches of 1989, Tsaloukhidis again had started all, a feat also accomplished by goalkeeper Oikonomopoulos, full-back Khatziathanasiou, centre-back Mavridis, and midfielder Nioplias. They would be without both Oikonomopoulos and the influental Mavridis here, seeing PAOK 'keeper Gitsioudis back between the sticks. There would be a first start for Aris midfield man Oikonomidis and Panionios wide man Maragkos. Panathinaikos forward Saravakos, who had scored their goal against England from the penalty spot, was again leading the line and wearing the captain's armband, having team mate Samaras alongside him as against the English. Their second most capped player behind Saravakos was right-back Apostolakis, yet with 23 against 45 the Olympiakos man was only just beyond halfway in caps behind the legendary Pana ace. As for Norway, reaching the finals of a major tournament had never been much of an issue since they had participated in the 1938 World Cup in France, two years after they had famously won the bronze medals in the 1936 Olympic football tournament in Germany (we will hastily add that they had qualified for the Olympic football tournament in 1980 too, but among a string of nations boicotting the event in Moscow, they failed to appear. Four years later, they would take East Germany's place in the 1984 games in USA, with the Warszaw pact countries this time around electing not to participate). Having failed under their two managers Røste Fossen and Swede Grip during the qualification for the 1988 European Championships, they had seen some promise under current boss Stadheim, despite losing their first two qualification matches in the on-going prelude. The 3-0 November win in Cyprus had done a lot of good, and their mood before the trip to Greece will have been decent, with the return leg against the Cypriots awaiting at their Ullevål home in May. For this their first fixture of 1989, the manager had opted for experience to compensate for the fact that the Norwegians were in their close season domestically: Only three of their starters were below double caps figures. Surprisingly, the visitors would take to the pitch in an experimental 3-5-2, where their experienced defence consisted of two players from the West German Bundesliga as well as Kojedal from French second tier outfit Valenciennes. In central midfielder Osvold, who had famously scored the winner in a 1-0 friendly win against Argentina just before the South Americans went on to win the World Cup in Mexico, they had a player currently plying his trade in the Greek league with PAOK, making him team mate with home 'keeper Gitsioudis. Since their last couple of matches, strong forward Sørloth had left champions Rosenborg to play for Borussia Mönchengladbach. Still, the Trondheim side had three players in the starting line-up, which would have been four had it not been for a persisting back injury to central midfielder Brandhaug. For the hosts, Panathinaikos, who would finish the 1988/89 season third, behind both champions AEK and arch rivals Olympiakos, had four starters. The Greeks were currently riddled with some autrociously low attendance figures for their international friendlies, three of their seven home matches in the 88/89 winter not even reaching four digits; this was one of those three. Surprisingly, Greece and Norway had never previously crossed path on the international stage; this was their first ever encounter. Referee was 41 year old Englishman Brian Hill, who would make his debut at international level. The home side came in a 4-4-2, utilising Koutoulas as a rather deep sweeper behind man-marker Kallitzakis. In midfield, Oikonomidis on the right was operating far less as a wide man than Maragkos on the left, often wanting to come inside to help out his central midfielders, where Tsaloukhidis was the anchor man, and with Nioplias as the playmaker. Among the strikers, it had often been so that captain Saravakos was playing to the right of centre, but here he was playing the first half as the left-sided of the two forwards. Norway were at 5-3-2, though it can be said that their two wide men, Løken on the right and Halle opposite, were given the opportunity to cross the halfway line. However, and more surprisingly, so too was spare man Kojedal at the heart of their defence: On several occasions during the opening 45 would the France based stopper carry the ball across the halfway line and into Greek territory. On either side of him were West Germany Bundesliga centre-backs Bratseth (right) and Giske respectively, whereas PAOK Thessaloniki based Osvold was the player whom the Norwegians would look to for distribution. On either side of Osvold were Gulbrandsen (right) and Berg, both busy little players. Gulbrandsen would be operating slightly closer to the right hand touchline than Berg on the other side of Osvold. Of the two up front, it was Agdestein making most of the running, with Sørloth rather stationary. In the second half it looks like Greece captain Saravakos is back in his more familiar right-sided striker's role, although him and Samaras will from time to time swap sides. When Vakalopoulos comes on for Koutoulas, he will slot straight into the deep libero position, but only after he has increased the home side's lead within seconds of appearing from the bench. When Sofianidis decides to take off playmaker Nioplias and replace him with Kavouras, the relatively tall substitute takes up the right-sided midfield position previously occupied by Oikonomidis, who in turn goes into the centre to take up the role left vacant by Nioplias. Oikonomidis is wearing the number 8 shirt, a number usually associated with a central midfield berth in the Greek national team towards the tail end of the 80s. However, he had until the introduction of Kavouras been playing as something of a right-sided midfielder, though occasionally helping out the central two. Kavouras, though sporting a frame which did not resemble that of a typical wide man, would be better at keeping width along the right hand side. Norway's two substitutes would both be straight swaps for the players they replaced, with 'Mini' Jakobsen and Fjørtoft seeing the game out as the forward pairing. Despite losing the toss, it is Greece who kick the first half into action in front of the largely vacant stands. The stadium looks almost completely deserted with less than a thousand registered people inside, but at least some sound is generated through the hordes of school children present. Why Norway captain Giske had opted to let the hosts kick off remains unknown, as there did not seem to be particular weather conditions to motivate such a choice. If anything, though, the visitors would play with a slight breeze behind them during the opening 45 minutes. It is a young selection from the home side, and it is their defence which is first called into action as they face a free-kick swung into the area by Osvold halfway inside the Greek half. Defensive midfield man Tsaloukhidis gives away a corner from the left, which after only a couple of minutes' play could have yielded the opening goal. From Berg's flag kick, Giske connects with his head. For whatever reason, though, the English referee whistles for a Greece free-kick, possibly for an off the ball incident from Sørloth on Koutoulas, as the visiting skipper seems to head home after Gitsioudis had gone walkabout in the area. As it is, right-back Apostolakis is positioned on the goal line and puts his right arm out to stop the ball from finding the net. With the whistle already sounded, he could do so without fear of retribution from the ref. There is not a lot to report early on apart from the set piece incident. Both sides have left-footed playmakers: Nioplias for the home side, Greece based Osvold for the visitors. However, whereas Osvold prefers to be played into his deep midfield position by a team mate, for him to try and direct play, Nioplias wishes to be more expressive in his attempts to get to the ball. The home side's number 10 also has a certain desire to drive forward ball at feet, something which appears to be unthinkable for Osvold. Yet, neither playmaker is able to stamp much authority on proceedings. It is Norway who dominate possession in the opening quarter of the game, with the hosts looking to catch them on the break. This is typified by quick and nimble players such as Oikonomidis and, predominantly, Saravakos. With visiting libero Kojedal prone to advancing beyond the halfway line with the ball at his feet, Greece try to create breaks by taking the ball off Norway's number 3, thus exposing the visitors' remaining defence. Kojedal's hardly a virtouso along the deck, so nicking the ball away from him can be done through aggression in midfield, where Tsaloukhidis is doing well in battle, often coming out of challenges on top. Yet the home side will create their first attempt at goal from a set-piece: Saravakos' left wing corner is headed just wide by Samaras. The slightly nervously looking Norway goalkeeper had sold himself short and poorly misjudged the flight of the ball. Had the forward's header hit target, Greece would have been a goal to the good. There is little in terms of inspired wing play from the home side, where left-sided midfielder Maragkos is operating quite defensively, first and foremost looking to deny the Norwegians space along his flank. Maragkos' priority appears to lie in helping out left-back Khatziathanasiou. And along the right hand side of their midfield, Oikonomidis too often drifts inside in order to pose a threat to left-sided Norway wing back Halle. Among the four players designed to flank roles, it is definitely Norway's Løken who makes the most use of what he's got ahead of him, though his crossing in the opening period on a couple of occasions leaves a lot to be desired. Near to 30 minutes played, Saravakos shows his opportunism in letting fly a half-volley from 25 yards. It sails wide, though perilously close to the shaky By Rise's left hand post. The visitors' 'keeper had moments earlier again showed his poor decision-making when failing to get close to another Greece corner kick, and he had been fortunate to escape without conceding. However, had Saravakos' attempt hit the target, the 'keeper could not have been blamed. It was a spectacular effort, and one which had deserved a better fate. Greece had gradually won back possession, and were by now the better side. Saravakos' forward mate Samaras was doing a good job in stretching the Norwegian central defenders, and in addition to being a threat in the air, he was deceptively quick along the ground. He would try and exploit the gap between Halle and Giske to the left in Norway's defence. Eight minutes from half time it was indeed Samaras who would open the scoring: He took a flick-on from Saravakos and got beyond Kojedal, and as the pair came storming into the Norwegian penalty area, Samaras rounded the visitors' libero a second time, this time on the ground. He contrived by placing a low left-footed effort under By Rise, a shot which the 'keeper should have dealt with. Little more would happen in front of either goal, apart from another route one effort from the home side. Libero Koutoulas knocked the ball forward from deep inside his own half, something which would have seemed unlikely prior to kick-off: If any team would attempt such tactics, surely it would be Norway? 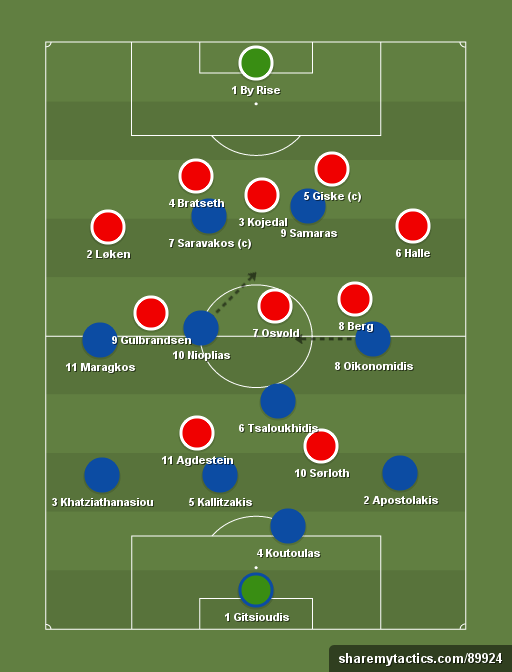 Though Greece were by far the more direct in the opening half, and as Saravakos lost out to Kojedal in the air from Koutoulas' pass, the defender's touch let Tsaloukhidis, of all people, in between the two remaining Norwegian central defenders. However, the midfielder knew he did not have pace to trouble the visitors with, so he had to shoot first time, and his left-footed effort was this time dealt with comfortably by By Rise low down. The hosts were ok value for their slender lead, and the visitors had hardly created anything in front of Gitsioudis' goal. Referee Brian Hill is all smiles for the start of the second half. Like the Norwegians, he was probably happy to escape the northern European winter climate for a period of time. He watches and then puts the whistle to his mouth to signal the start of the second half. There appears to be no changes in either team, so it will be up to Norway to take the game to their hosts. Greece had seemed relatively comfortable at the back, where Koutoulas was operating a good few yards behind the other central defender Kallitzakis. Koutoulas had left a decent impression, and appeared to be a more calm and assured presence than the long haired Kallitzakis, who would often rush into a challenge, typically trying to unsettle Sørloth as Norway's target man. Kallitzakis would also have a couple of clashes with Agdestein, the more mobile of the two visitors' strikers, but the defender appeared to relish more the battle with Rosenborg forward Sørloth. It is Norway who can kick period 2 under way. The players could have been forgiven to feel that playing in front of an almost empty Olympic stadium was uninspiring, but those who had turned up were doing their utmost to create some kind of atmosphere, and early in the second half there's a couple of bangs sounding. Probably some of the school kids present had brought firecrackers, but this did not seem an unusual feature at a match in Greece anyway. The pace of the game continued to be laboured, and there were few signs early on that Norway were attempting to get back at level terms. However, had they not perhaps moved their wide players slightly further up the pitch? Løken down the right hand side had got forward on a few occasions during the opening half, but now it seemed that even Halle on the opposite side was starting to involve himself. Norway were clearly trying to get into crossing positions, and it was left to the Greek wide midfielders to protect their full-backs. This appeared to be a fine feature in the game of both Oikonomidis on the right and Maragkos on the left. Out of the blue, Sørloth had a headed attempt striking the lower left post of Gitsioudis' goal. Greece had been rather lenient in their pressure inside their own half, and had let the busy Berg feed Løken to swing a cross in. It was hardly a cross which set any football match alight, as it did not carry a lot of momentum, but nevertheless Sørloth managed to direct his header against the post, despite having to backtrack somewhat to get into position ten yards away from goal. Marking was absent, and the home side had been fortunate to escape. As it were, this seemed to throw some confusion into the Greek defence, and the next wave of Norway attack would bring about the equalizer, with the tall Bratseth poking home on the far post after Osvold had seen his close range effort parried away by his PAOK team mate Gitsioudis, and Sørloth's overhead kick had provided the Werder Bremen defender with the assist. From their only spell of what could resemble sustained pressure so far in the game, the visitors were level. There was little doubt that home boss Sofianidis was using this flurry of winter and spring friendlies to test out a lot of players, hardly doing a lot of good to the rhythm in the side. Indeed, only four players in their starting eleven had featured during their opening two qualification ties so far, with left-back Khatziathanasiou, defensive midfielder Tsaloukhidis and forward Saravakos all turning out for both the 1-1 draw at home to Denmark and the 3-0 reverse in Romania. Midfield playmaker Nioplias had also started in Bucharest. The few players giving a better account of themselves so far were possibly libero Koutoulas, midfielder Oikonomidis and striker Samaras. In Koutoulas' case, though, it felt as he was fighting a losing battle, with regular centre-halfs Mavridis and Manolas ahead of him in the pecking order at this time. Indeed, the libero would be the first player to come off as he was replaced by another long haired defender in Vakalopoulos, who would slot into the libero role. Free-kicks inside the area are a rare occurence, but Norway defender and goalscorer Bratseth was penalised for obstructing Samaras only a couple of minutes after their 1-1. The away team seemed to have cleared the danger when midfielder Berg got to the ball after it had ricocheted off the defensive wall from Saravakos' free-kick, yet his feeble attempt at clearing only went as far as back to Saravakos. The home skipper fed Nioplias on the edge of a crowded area, and the Greek number 10 was then tackled by the same Berg, trying to redeem his error, resulting in the ball finding its way through the legs of Bratseth and into the feet of the only recently arrived Vakalopoulos. The new libero's low left-footed finish ended up under By Rise and into the back of the net. Greece had restored their lead after some sloppy defensive play by Norway. From 2-1 followed 3-1 only another couple of minutes later, with Norway unaware for a few moments with Oikonomidis in possession of the ball just inside his own half. The midfielder had spotted the forward run by full-back Apostolakis, and fed a perfect ball in his direction. Norway left-sided player Halle had been unable to close Apostolakis down, and bursting into the right side of the area and towards the byline, the right-back fed a low cross which reached defensive midfielder Tsaloukhidis on the far post. Greece' number 6 had been followed in his track by Bratseth, but the defender was unable to prevent Tsaloukhidis getting his foot to the cross, and despite the lack of a clean touch, the ball bizzarely ended up in the back of By Rise's net. The 'keeper was probably surprised at the nature of the finish, and having expected a cleaner strike from Tsaloukhidis rather than this scuffed effort, only embarrassed himself with his futile, desperate attempt at getting a paw to the ball to try and keep it out. Hard man Tsaloukhidis was indeed having a fine game, also on one occasion during the first half having come close to troubling Norway's goal despite his primary defensive focus. Norway, most likely already out of contention for qualification from their qualifying group following two defeats from three, were not doing their chances much good in trying to get a result from their first ever encounter with Greece either. Yet, they were well used to being also-rans. After three goals in quick succession, Sofianidis elected to take off midfielder Nioplias and replace him with Kavouras. This saw Oikonomidis shuffle inside into a central position, with the newly arrived substitute taking up the right-sided position. Kavouras was a rather tall player, and did not seem like your typical wide man, especially in a Greek team where height was not the most prominent feature. The visitors needed to get their composure back, but their defence seemed all over the place, and in midfield both Berg and in particular Gulbrandsen were just running between the Greek players without being able to see possession much. It was another alarming point from their perspective that possibly their two most anonymous players at the start of the second half were Kojedal, at the heart of their three man central defence, and Osvold, at the core of their three man central midfield. Yet there was no sign of either player imminently being replaced. Five minutes after 3-1 came the fourth home goal. With Oikonomidis, a more defensive player than Nioplias, in the centre of midfield, Greece appeared to sit deeper after their third goal, and they would look for their strikers to make runs at either side of the Norwegian defence, and for their midfielders to knock balls directly into their direction. This is how the next goal came about, as they broke quickly following a long Norway throw into the Greek box. Tsaloukhidis cleared deep inside his own area, the ball finding its way through to Samaras in a right-sided midfield position. He played Saravakos in a more central position and embarked on a run into the Norwegian half of the pitch. As no one was putting pressure on Saravakos, it was a simple task for the home captain to return the ball to Samaras, running in behind Kojedal, with the Norway libero only making a half-hearted attempt at following him. Samaras had pace to burn for a relatively tall man, and once inside the penalty area he squared the ball for the on-rushing Saravakos, who had also not been followed in his track by a visiting player. He had the easiest of tasks when side-footing home 4-1. This was getting humiliating for the visitors, and conceding thrice in a blitz-like spell early in the second half against a side which itself had only the slimmest of chances of progressing to the World Cup, would hardly do their confidence much good. Surely, it was time for Stadheim to ring the changes. With the game continuing to follow a pattern of defensive harakiri, it is Norway next who come close to reducing the arrears when Agdestein picks himself up from the floor after Kallitzakis' challenge inside the Greece penalty area. The agile forward, isolated up front along with Sørloth for large spells so far, thumps a left-footed effort against Gitsioudis' bar from inside the area. It had been as clean a strike as you'd have wanted, and the home side had had another fortunate escape. It was incredible, really, how any goalmouth action in the first 20 minutes of the second half would either result in a goal or a strike against the woodwork. Still three goals down, both Norway forwards had hit the frame of the Greek goal. Indeed, the follow-up attempt from Osvold after the ball had come back out following the shot against the crossbar, had led to Khatziathanasiou slicing a clearance out for a Norway corner. With 65 minutes on the clock, Osvold's set-piece would find its way to Sørloth's head, and despite Gitsioudis' efforts to come and punch, it was a simple task for the forward to head home a fourth goal in 13 minutes. What followed could best be described as "scrappy", with neither side mustering much in terms of creativity. Indeed, the feeling was that there was now a collective wish for peace, since the first 20 minutes of the half had seen such an incredible amount of goals and goalmouth action. Norway had time and again crumbled when under pressure, yet it was a forward who was the first to go as Stadheim brought on his primary substitute, a like for like deal with the diminutive Jakobsen replacing Agdestein. Løken and Halle would again be utilised along their respective flanks, and both would get into a couple of good crossing positions, but in particular Halle wasted his opportunities. On one occasion the Lillestrøm player had an entire penalty area to aim at, yet without being under pressure contrived to place his cross well behind Gitsioudis' goal. The home side were not much better, unable to inflict further damage on the visitors. However, they appeared to be content having already scored four times. Some six minutes from time, Norway made their second and final substitution in bringing Fjørtoft on for Sørloth. The departing striker had both struck the post and scored, and had also had an headed effort over the bar after some nice work by fellow Rosenborg forward Jakobsen a few minutes earlier. Despite his lack of pace and mobility, one felt that Sørloth was the most dangerous among the visitors' attacking players, and he did not seem overly pleased at being substituted. Fjørtoft looked like another wily character, and was possibly not what the game needed at this point. How a player like Kojedal managed to fulfill the 90 minutes remains a mystery. He hardly seemed bothered all afternoon, and a disastrous feature in his play were his efforts to take the ball inside the Greek half, something which happened with such frequency that it had clearly been rehearsed. The success rate, however, was diabolical. The match petered out in unspectacular fashion, neither team unable to do anything inside the final few minutes. There had been five second half goals, but most of them had come about as a result of sloppy defensive play from both sides. There had been few individual performances worthy of praise, though the home side will have been pleased to see both forwards emerge with a goal. And surely, Koutoulas had put himself into the frame for further international assignments. The same could probably be said for Oikonomidis, though hardly for 'keeper Gitsioudis, whose failed attempt to claim the ball for Sørloth's goal left a poor impression, and his general play also did not stand out. In all honesty it was a poor game, and neither team's defences could claim much pride. The mad spell of four goals inside 13 second half minutes was the defining character of the match, and the ease with which the home side's goals came about will have worried the Norwegian management team. Goalkeeper By Rise's performance was hardly that of an assured international, and the unease seemed to spread like a disease through the team. Yet they scored twice and had two efforts off the framework. Greece were also not too sound, and few players will have put themselves into contention for further international recognition. This was just one of a host of friendlies before they would resume qualification play.